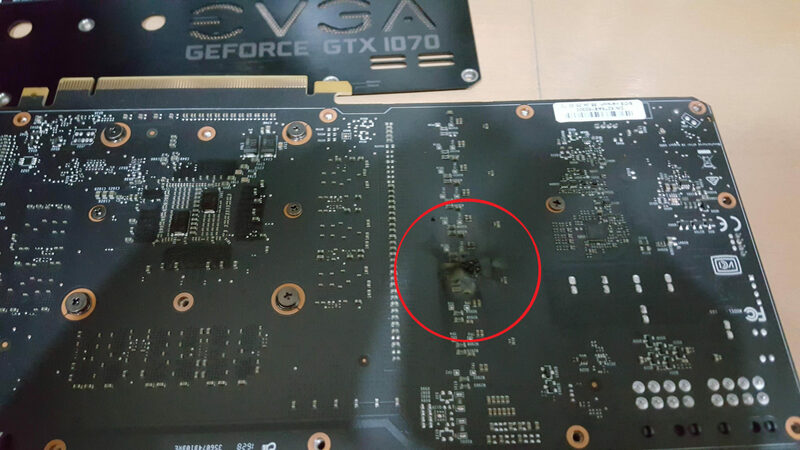 A devastating issue with the chipsets present inside the E.V.G.A variants of the GeForce GTX 1070 and the GeForce GTX 1080 are causing their VRMs to overheat and catch fire, ultimately causing the card to die. All variants of E.V.G.A including the ACX 3,0 Coolers , are catching fire. Users reported on numerous forums that there PCs had shut down and without the slightest warning, their Graphics Cards burst into flames right in front of thir eyes. Come to think of it how painful would it be watching your GPU burn and you can not do anything? Many forums have been loaded with such stories. E.V.G.A’s voltage regulation circuitry is not to blame. The solution is rated to withstand temperatures of up to 125c and deliver up to 200 amps of current at that temperature. Enough to keep the GTX 1080’s 180 amp requirements happily met with some small room to spare for overclocking. However, despite the spectacular cooling design, it ended up being not enough to cool down the GPU thanks to the air being trapped inside and this is what ultimately led to overheating and causing the GPU to Rest In Piece! If you do have an E.V.G.A GeForce GTX 1070 or 1080 with ACX Cooler installed, you need not worry as E.V.G.A is already aware and it is currently offering existing GTX 1080 and GTX 1070 owners a VRM thermal pad kit for free, which you can get here. Alternatively, users have the option to return their graphics cards directly to EVGA to exchange it for a card with the thermal mod already installed. Previous articleCall Of Duty: Modern Warfare Remastered Listed On Windows Store Suggests It Might Be Available Separately.